KABUL, Feb 23: Afghan government and Taliban representatives are expected to meet in Islamabad by the first week of March for their first direct talks since a previous round of the peace process broke down last year, officials said on Tuesday. In a joint statement released by the Afghan foreign ministry, they said the first round of direct peace talks is expected to take place by the first week of March in the Pakistani capital. On Monday, the powerful chief of the Pakistan army, Gen. Raheel Sharif met officials from Qatar, where the Taliban maintains a political office, to prepare the way for Tuesday’s meeting, the fourth in a series of quadrilateral encounters aimed at laying the ground for full peace talks. However the Taliban has been riven by factional infighting since last year’s announcement of the death of the movement’s founder Mullah Mohammad Omar some two years earlier. The Taliban has not yet clearly indicated whether it will take part in any talks with the Western-backed government in Kabul. New leader Mullah Akhtar Mansour has laid down preconditions for taking part in any talks, including the withdrawal of all foreign forces, while a breakaway faction that opposes him has rejected any negotiations. But officials in Kabul have expressed hopes that at least some parts of the movement and other insurgent groups affiliated with it can be persuaded to join. 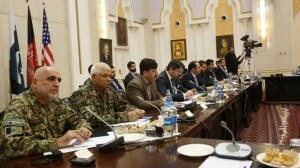 Tuesday’s four-way talks in Kabul came against a backdrop of continuing violence and increasing military pressure from the Taliban, which has stepped up its insurgency since the withdrawal of most international troops from combat in 2014. Over the weekend, Afghan officials confirmed that troops had pulled out of two key districts in Helmand, leaving the entire northern half of the volatile province in the hands of the insurgents. Insurgents have also kept up their suicide bombing campaign, with 14 people killed in an attack on a clinic in Parwan province north of Kabul on Monday.